One of the South’s favorite magazines, Garden and Gun, recently ran a feature on their website called Top 21 Barbecue Sandwiches. As a barbecue lover, my mouth drooled throughout the entire slideshow. As an Owensboro, Kentucky resident, I took great pride in the fact that Owensboro’s own Old Hickory was included! 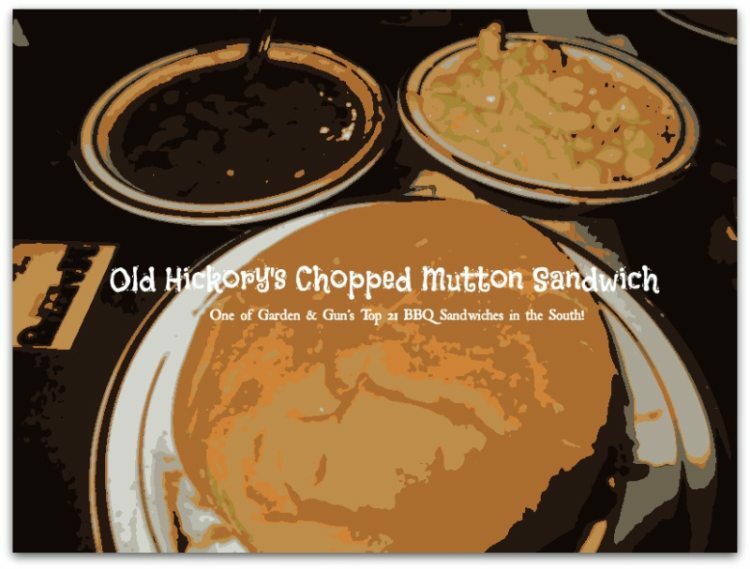 Old Hickory’s Chopped Mutton Sandwich made the list and the picture looks as Heavenly as the rest. For good reason, too. Old Hickory is, quite honestly, one of the best Barbecue restaurants in all of Kentucky – or anywhere for that matter. I’m a pork fanatic, so I usually order the pulled pork. I have to admit, though, the mutton is completely and utterly out of this world. When topped off with Old Hickory’s own barbecue sauce (best sauce I’ve ever had), it’s an experience you never forget. I also have to give a BIG shout out to Old Hickory’s sides – they’re fantastic. A lot of barbecue restaurants “phone it in” with the sides because they assume all anyone’s really interested in is the meat anyway. Thankfully Old Hickory doesn’t “phone it in” with anything. As soon as you get up to leave the restaurant, you’re already planning your next trip back. That happened with us on a recent trip. I was having lunch with some of my favorite people on earth – two of my daughters and two of my sons-in-law. When we stood up to leave, we were all buzzing about our next trip – even with stomachs completely full, all we could think about was our next meal. In addition to the great food, the prices are reasonable, the service is extra friendly, and the entire atmosphere is the type of “charming” that only the South can pull off. Great write-up! That place is awesome…which is probably why I used them to cater my wedding. 😉 But congrats to them on making that list! Thanks, they deserve all the attention they get. Best BBQ around! Love their food, the service, the atmosphere – everything.